The three wavelength bands of ultraviolet radiation, i.e. UV-A, UV-B and UV-C, all have different effects on plants. UV-C, which is not a component of the natural environment, has predominantly negative effects, UV-A positive effects from the perspective of plant development and survival. The effects of UV-B can be positive or negative. Of course this is a generalization, and the official spectral limits between the bands, 280 and 315 nm, do not mark sudden changes in biological actions. True apoptosis induced by ultraviolet radiation in plants has so far been observed only in one case, while there are numerous observations of UV effects on the related phenomenon of senescence. Abbas, H.K., Tanaka, T., Duke, S.O., Porter, J.K., Wray, E.M., et al. (1994). Fumonisin and AAAL-toxin induced disruption of sphingolipid metabolism with accumulation of free sphingoid bases. Plant Physiol. 106, 1085-1093. A.-H.-Mackerness, S., Jordan, B.R., and Thomas, B. (1999). Reactive oxygen species in the regulation of pho-tosynthetic genes by ultraviolet-B radiation (UV-B: 280-320 nm) in green and etiolated buds of pea (Pisum sativum L.). J. Photochem. Photobiol. B: Biology 48, 180-188. Arthur, J.M., and Newell, J.M. (1929). The killing of plant tissue and the inactivation of tobacco mosaic virus by ultraviolet radiation. Am. J. Bot. 16, 338-353. Audic, A., and Giacomoni, P.U. (1993). DNA nicking by ultraviolet radiation is enhanced in the presence of iron and of oxygen. Photochem. Photobiol. 57, 508-512. Benda, T.A. (1955). Some effects of ultra-violet radiation on leaves of French bean (Phaseolus vulgaris L.). Ann. Appl. Biol. 43, 71-85. Björn, L.O. (1996). Effects of ozone depletion and increased UV-B on terrestrial ecosystems. Int. J. Environ. Stud. 51, 217-243. Björn, L.O. (1999). UV-B effects: Receptors and targets. In Concepts in Photobiology: Photosynthesis and Photomorphogenesis (G.S. Singal, et al., Eds. ), pp. 821-832. Narosa Publishing House, New Delhi, and Kluwer, Dordrecht. Björn, L.O., Callaghan, T.V., Johnsen, I., Lee, J.A., Manetas, Y., Paul, N.D., Sonesson, M., Wellburn, A., Coop, D., Heide-J0rgensen, H.S., Gehrke, C., Gwynn-Jones, D., Johanson, U., Kyparissis, A., Levizou, E., Nikolopoulos, D., Petropoulou, Y., and Stephanou, M. (1997). The effects of UV-B radiation on European heathland species. Plant Ecology 128, 252-264. Britt, A.B. (1996). DNA damage and repair in plants. Annu. Rev. Plant Physiol. Plant Mol. Biol. 47, 75-100. Cadet, J., Anselmino, C., Douki, T., and Voiturez, L. (1992). Photochemistry of nucleic acids in cells. J. Photochem. Photobiol. B: Biol. 15, 277-298. Cuello, J., Sanchesz, M.D., and Sabater, B. (1994). Retardation of senescence by UV-A light in barley (Hordeum vulgare L.) leaf segments. Envir. Exp. Botany 34, 1-8. Danon, A., and Gallois, P. (1998). UV-C radiation induces apoptotic-like changes in Arabidopsis thaliana. FEBS Lett. 437, 131-136. Flores-Moya, A., Hanelt, D., Figueroa, F.-L., Altamirano, M., Vinegla, B., and Salles, S. (1999). Involvement of solar UV-B radiation in recovery of inhibited photosynthesis in the brown alga Dictyota dichotoma (Hudson) Lamouroux. J. Photochem. Photobiol. B: Biology 49, 129-135. Gates, F.L. (1928). On nuclear derivatives and the lethal action of ultra-violet light. Science 68, 479-480. Gates, F.L. (1929). A study of the batericidal action of ultra violet light. I. The reaction to monochromatic radiations. J. Gen. Physiol. 13, 231-248. Gates, F.L. (1930). A study of the action of ultra violet light III. The absorption of ultra violet light by bacteria. J. Gen. Physiol. 14, 31-42. Gehrke, C., Johanson, U., Gwynn-Jones, D., Björn, L.O., Callaghan, T.V., and Lee, J.A. (1996). Effects of UV-B radiation on a subarctic heathland. Ecol. Bull. 45, 192-203. Gilchrist, D.G. (1998). Programmed cell death in plant disease: The purpose and promise of cellular suicide. Annu. Rev. Phytopathol. 36, 393-414. Godar, D.E. (1999). UVA1 radiation triggers two different final apoptotic pathways. J. Invest. Dermatol. 12, 3-12. Häder, D.-P., and Liu, S.M. (1990). Motility and gravitactic orientation of the flagellate Euglena gracilis impaired by artificial and solar UV-B radiation. Curr. Microbiol. 21, 161-168. Horsefall, M., and Lawrence, C.W. (1994). Accuracy of replication past the T-C (6-4) adduct. J. Mol. Biol. 235, 465-471. Jacobson, M.D., and Raff, M.C. (1995). Programmed cell death and Bcl-2 protection in very low oxygen. Nature 374, 814-816. Jiang, N., and Taylor, J.S. (1993). In vivo evidence that UV-induced C fwdarw T mutations at dipyrimidine sites could result from the replicative bypass of cis-syn cyclobutane dimers or their deamination products. Biochemistry 32, 472-481. Khalilova, F. Kh., Rakitina, T.Ya., Vlasov, P.V., and Kefeli, V.I. (1993). Effects of ultraviolet radiation (UV-B) in the growth and ethylene production of three genetic lines of Arabidopsis thaliana. Fiziologia Rastenii (Moscow) 40, 764-769. Kolesnick, R.N., and Krönke, M. (1998). Regulation of ceramide production and apoptosis. Annu. Rev. Physiol. 60, 643-665. Kulms, D., Pöppelmann, B., Yarosh, D., Luger, T.A., Krutmann, J., and Schwarz, T. (1999). Nuclear and cell membrane effects contribute independently to the introduction of apoptosis in human cells exposed to UVB radiation. Proc. Natl. Acad. Sci. USA 96, 7974-7979. MacLaughlin, J.A., Anderson, R.R., and Holick, M.F. (1982). Spectral character of sun light modulates photosynthesis of pre vitamin D3 and its photoisomers in human skin. Science 216, 1001-1003. Mitchell, D.L., Nguyen, T.D., and Cleaver, J.E. (1991). Nonrandom induction of pyrimidine-pyrimidone (6-4) photoproducts in ultraviolet-irradiated human chromatin. J. Biol. Chem. 265, 5353-5356. Murphy, T.M. (1990). Effect of broadband and visible radiation on hydrogen peroxide formation by cultured rose cells. Physiol. Plant. 80, 63-68. Murphy, T.M., and Vu, H. (1996). Photoinactivation of superoxide synthases of the plasma membrane from rose (Rosa damascena Mill.) cells. Photochem. Photobiol. 64, 106-109. Negash, L., Jensen, P., and Björn, L.O. (1987). Effect of ultraviolet radiation on accumulation and leakage of 86Rb in guard cells of Viciafaba. Physiol. Plant. 68, 200-204. Nishigaki, R., Mitani, H., and Shima, A. (1998). Evasion of UVC-induced apoptosis by photorepair of cyclobutane pyrimidine dimers. Exp. Cell Res. 244, 43-53. Nottaris, D., Crespi, P., Greppin, H., and Penel, C. (1997). Effect of UV-C on two cell lines from sugarbeet. Arch. Sci. 50, 223-232. Overmyer, K., Brosche, M., and Kangasjärvi, J. (2003). 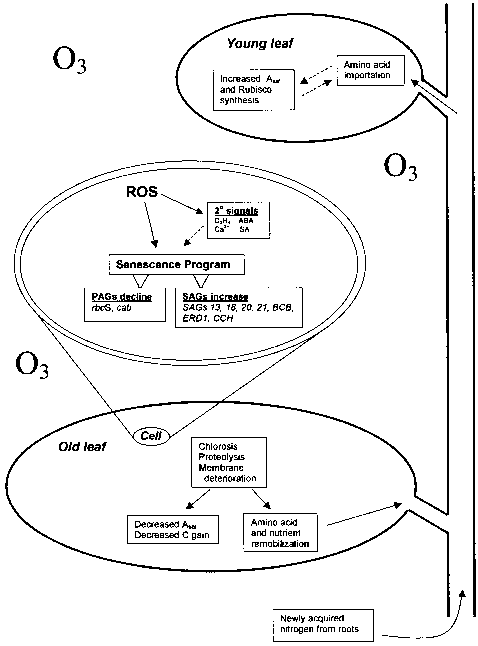 Reactive oxygen species and hormonal control of cell death. Trends Plant Sci. 8 (in press, available online as of 24 June 2003). Predieri, S., Norman, H.A., Krizek, D.T., Pillai, P., Mirecki, R.M., and Zimmermann, R.H. (1995). Influence of UV-B radiation on membrane lipid composition and ethylene evolution in 'Doyenne d'hiver' pear shoots grown in vitro under different photosynthetic photon fluxes. Env. Exp. Botany 35, 151-160. Pushkareva, M., Obeid, L.M., and Hannum, Y.A. (1995). Ceramide: an endogenous regulator of apoptosis and growth suppression. Immunol. Today 16, 294-297. Scheuerlein, R., Treml, S., Thar, B., Tirlapur, U.K., and Häder, D.-P. (1995). Evidence for UV-B-induced DNA degradation in Euglena gracilis mediated by activation of metal-dependent nucleases. J. Photochem. Photobiol. B: Biology 31, 113-123. Schnitzler, J.-P., Langebartels, C., Heller, W., Liu, J., Lippert, M., Döhring, T., Bahnweg, G., and Sandermann, H. (1999). Ameliorating effect of UV-B radiation on the response of Norway spruce and Scots pine to ambient ozone concentrations. Global Change Biology 5, 83-94. Schwarz, T. (1998). UV light affects cell membrane and cytoplasmic targets. J. Photochem. Photobiol. B: Biology 44, 91-96. Sheikh, M.S., Antinore, M.J., Huang, Y., and Fornace, A.J., Jr. (1998). Ultraviolet-irradiation-induced apoptosis is mediated via ligand independent activation of tumor necrosis factor receptor 1. Oncogene 17, 25552563. Shimuzu, S., Eguchi, Y., Kosaka, H., Kamiike, W., Matsuda, H., and Tsujimoto, Y. (1995). Prevention of hypoxia-induced cell death by Bcl-2 and Bcl-xL. Nature 374, 811-813. Siemens, C.W. (1880). On the influence of electric light upon vegetation, and on certain physical principles involved. Proc. Roy. Soc. London 30, 210-219. Smith, C.A., Wang, M., Jioang, N., Che, L., Zhao, W., and Taylor, J.S. (1996). Mutation spectra of M13 vectors containing site-specific cis-syn, trans-syn-I, (6-4), and Dewar pyrimidone photoproducts of thymidylyl-(3'fwdarw 5')-thymidine in Escherichia coli under SOS conditions. Biochemistry 35, 4146-4154. Spiegel, S., Foster, D., and Kolesnick, R. (1996). Signal transduction through lipid second messengers. Curr. Opin. Cell Biol. 8, 159-167. Takacs, Z., Csistalan, Zs., Sass, L., Laitat, E., Vass, I., and Tuba, Z. (1999). UV-B tolerance of bryophyte species with different degrees of desiccation tolerance. J. Photochem. Photobiol. B: Biology 48, 210-215. Tanada, T., and Hendricks, S.B. (1953). Photoreversal of ultraviolet effects in soybean leaves. Am. J. Bot. 40, 634-637. UNEP (United Nations Environment Programme) (1995). Environmental effects of ozone depletion: 1994 assessment. Ambio 24, 137-196. UNEP (United Nations Environment Programme) (1998). Environmental effects of ozone depletion: 1998 assessment. J. Photochem. Photobiol. B: Biology 46, 1-108. UNEP (United Nations Environment Programme) (2002). Environmental effects of ozone depletion and its interactions with climate change: 2002 assessment. Photochem. Photobiol. Sci. 2 (1, UNEP Special Issue), 1-72. Wang, L., Xu, D., Dai, W., and Lu, L. (1999). An ultraviolet-activated K+ channel mediates apoptosis of myeloblastic leukemia cells. J. Biol. Chem. 274, 3678-3685. Wu, J.H. (1971). Retardation f ultraviolet light accelerated leaf senescence by a cytokinin: N6 benzyladenine. Photochem. Photobiol. 13, 179-181. Wu, J.H., Skokut, T., and Hartman, M. (1973). Ultraviolet-radiation-accelerated leaf chlorosis: Prevention of chlorosis by removal of epidermis or by floating leaf discs on water. Photochem. Photobiol. 18, 71-77. Yoshida, S., and Uemura, M. (1986). Lipid composition of plasma membranes and tonoplasts isolated from etiolated seedlings of mung bean (Vigna radiata L.). Plant Physiol. 82, 807-812. Yu, S.G, and Björn, L.O. (1999). Ultraviolet-B stimulates grand formation in chloroplasts in the African desert plant Dimorphotheca pluvialis. J. Photochem. Photobiol. B. 49, 65-70.